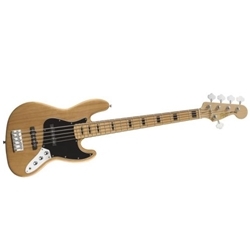 Squier's Vintage Modified Jazz Bass is now available in a five-string model. Like its mid-'70s-style four-string brother, the Vintage Modified Jazz Bass V has a handsome natural-finish soft maple body and one-piece maple neck with sharp-looking black binding and block inlays on the 20-fret maple Fingerboard. Other features include dual Fender-Designed Single-Coil Jazz Bass pickups, three-ply pickguard, five-saddle bridge and chrome hardware and tuners.